This article is about the character. 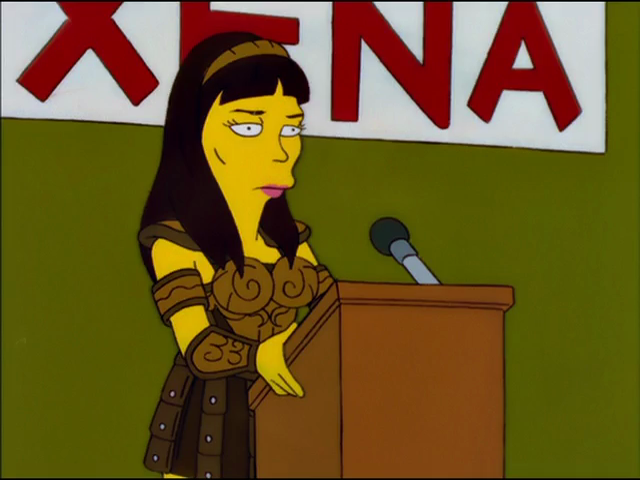 For the guest star, see Lucy Lawless. Lucy Lawless is an actress famous for playing Xena. When Kent Brockman visited the library the librarian asked him what he was wearing. He told her that he asked the questions here Lucy Lawless. The Collector kidnapped her using a giant magnet to attract her metal breastplate. She goes to get out of the clothing when several geeks at the convention she was at took out cameras and she decided against it. Stretch Dude and Clobber Girl went to save her. At The Collector's lair, Lawless kept insisting that she wasn't Xena. Eventually, after Stretch Dude and Clobber Girl had been captured, Lawless freed herself, stopped the collector and flew off with Stretch Dude and Clobber Girl. Clobber Girl says that Xena can't fly and Lawless tells her that she is not Xena. Modified on April 3, 2016, at 05:25.